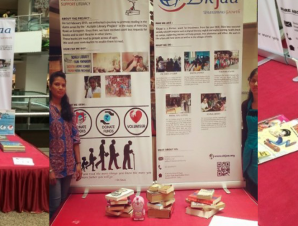 Ekjaa Foundation rolled out Books donation campaign in Mumbai in association with Infinity Mall. In the summer event of Infinity Mall Funomania we were allowed to install collection centers in Malad and Andheri malls of Infinity. Ekjaa volunteers participated in the 21 days event of Book collection drive. The proceeds of the collection were contributed towards the development of Achala Library and nearly 5000+ books were collected.